This New York State Forest comprises approximately 9,000 acres of land, with approximately 2 miles of riverbed on the East Branch of the Delaware River, abutting the southern boundary of the Catskill Park. 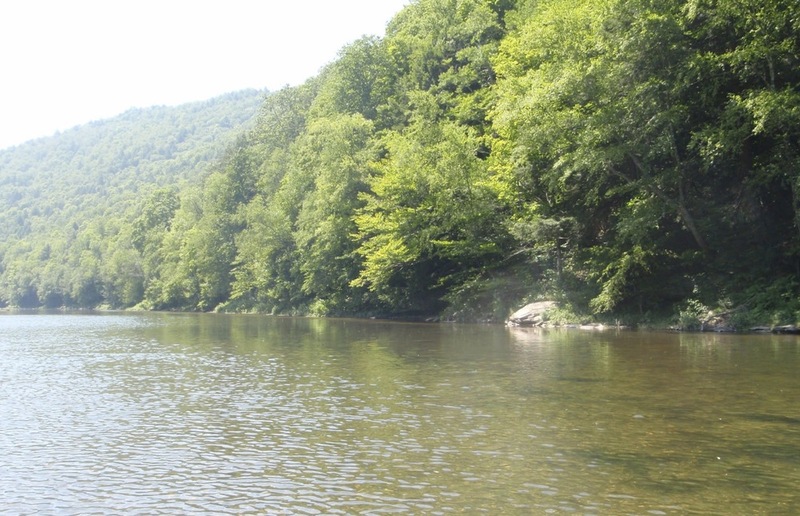 Fifteen miles of prime, thermally protected trout waters within the East Branch extend from Pepacton Reservoir at Downsville to Jaws, where the Beaverkill meets the East Branch at the village of East Branch. Tomannex lies approximately 2/3 of the distance downstream from Pepacton to Jaws, just upstream of the hamlet of Harvard in the Town of Hancock in the south east section of Delaware County. WTF received an Adopt-A-Natural Resource (AANR) agreement from NYS DEC Region 4 in 2011 for these 2 miles of river, and is currently in application for a permit to allow the installation of 15 boulder clusters in approximately 1 mile of this riverbed. The primary angling access to Tomannex is via the DEC Anglers Parking Lot at Long Flat on Route 30. This section of Tomannex contains prime water for big browns, but also many long skinny flats and shallow riffles with little cover for trout. Even shallow riffles provide cover for young of the year trout, but larger trout need deeper water or the type of overhead cover that this section of the East Branch is lacking. DEC fish surveys have confirmed a lack of adult trout as compared to young trout, and it is this problem that WTF has taken on with its Tomannex Trout Habitat projects. Didymo blooms, which over the last decade have resulted in decreased aquatic insect biomass available to trout. WTF’s goal for its Tomannex AANR is to address the above factors 1, 2 and 3. One of the remaining factors, declining water releases, is best addressed through improving the current Flexible Flow Management Plan for the Upper Delaware Reservoir system. Therefore WTF is working to resolve flow issues through participation with other Delaware Watershed Conservation Committee (DWCC) members who in turn work with the Regulated Flows Advisory Committee of the Delaware River Basin Commission (RFAC DRBC). The other factor, blooms of the invasive species Didymosphenia genimata, is more difficult. Current research (Didymosphenia geminata: Algal blooms in oligotrophic streams and rivers, by P. V. Sundareshwar et al., 2011) indicates that these blooms, typically occurring in oligotropic waters that are specifically deficient in phosphorus and organic nutrients and high in iron, which thru a biological process allows for both phosphorus uptake by Didymo as well as the fast growth rate of the bloom and the crowding out of beneficial forms of algae. Additional research needs to be performed to determine if organic chelators such as peat or other natural mechanisms can be used to reduce these algae blooms without other detrimental effects on the watershed. Once this research has been completed, we hope a work plan can be devised and permitted. Refuge Cover. All species of river trout prefer to be in the vicinity of overhead cover, and this appears to be a function of their DNA. Hatchery trout, when placed in two identical tanks, with equal numbers of trout of equal biomass and fed equal amounts of food at identical times of day, grow at different rates if one tank is provided with sufficient cover. The trout without cover are more “nervous,” or wary of predators, and thereby spend more energy. They thus have less available resources to use for growth than the trout with cover who are less “nervous.” Yet when trout feed, they generally must find lies within the river that allow them to see food passing overhead, and thus leave the overhead cover which otherwise protects them (unless sufficiently provided by overhanging trees, bridges, etc.). At these times trout will prefer to lie in a good feeding position that is close by the refuge cover they need. This refuge cover does not apear to be depth dependent, but does need to be several square feet in size or larger and can be provided by fallen trees and logs, large boulders with pockets of rock overhanging the riverbed, overhanging ledge, etc. Because Catskill rivers often run though areas of bluestone ledge and forests, moving ledge rock near the riverbank and/or felling bankside trees so that adequate cover area is created along the riverbanks is often sufficient. Due to the heavy spring runoffs we experience, these bluestone ledges and felled trees will need to be pinned in place to resist that force. Winter Cover. Juvenile and adult trout have different needs for winter cover. Juvenile trout prefer to spend the winter months in the interstitial spaces between 4" to 12" sized boulders in near the banks of riffles and runs. They prefer areas where predators can’t reach them, where there is sufficient dissolved oxygen for them to breath, and where they will not get frozen in by either surface or anchor ice during the winter months. 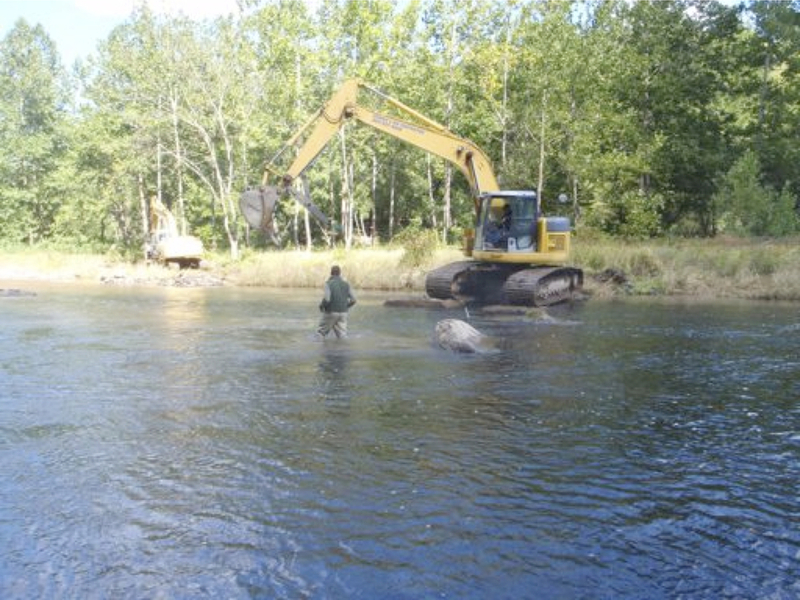 Rock piles with boulders in the 4” to 12" diameter size and located within riffle and run sections in water 12” or deeper and several feet from the edge of the bank are generally thought to be sufficient to provide this type of cover in Catskill streams. In contrast, adult trout prefer slow, deep pools during the winter months, with refuge cover either within the pool or immediately adjacent. The depth of pools that adult trout are generally found overwintering in are in the 3’ to 8' range. Refuge cover may be wood debris such as a fallen tree with a root wad, large boulders, rock ledges, etc. Cover that will protect them from eagles overhead, or otters swimming upstream. Feeding Lies. The boulders used for refuge and winter cover can often be used for feeding lies, if positioned near banks and under or adjacent to the bubble and scum lines that carry aquatic insects in the drift---downstream of the riffles and runs where most aquatic insects live most of their lives as larva. Project Funding. This project has been supported with a grant award of $1,500 from the Federation of Fly Fishers (FFF) Conservation Fund. Additional funds required to complete the project will be provided by WTF from member contributions. WTF has received an Article 15 permit from NYS DEC and remains in application for a Joint Permit from USACE for the placement of 15 boulder clusters on the Tomannex riverbed. The purpose of this project is to provide appropriate cover for juvenile trout in the areas where they prefer to hold and feed, the riffle/run areas of the river. This in turn will assist them in surviving the predators common to their environment such as eagles, otter, mink as well as large adult trout, and live into adulthood. Generally, they will then move downstream into pools and other appropriate cover as they mature. Upon approval by USACE we will post the project plans and budget. Project Funding. This project has been supported with a grant award of $1,500 from the Federation of Fly Fishers (FFF) Conservation Fund. WTF is applying with other conservation organizations for the additional funds required to complete this project.